The 2009 Lincoln Cent Professional Life coin was ceremoniously released by the United States Mint at the Old State Capitol in Springfield, Illinois on August 13, 2009. The cent is the third in the four coin series for the year designed to showcase the important aspects of Abraham Lincoln's life. This series was authorized as part of the Presidential $1 Coin Act of 2005 (Public Law 109-145) as a way to celebrate the bicentennial of his birth in 1809. The obverse of this coin is the same as it has been on the Lincoln cent for 100 years. It displays a right facing portrait of Lincoln designed by Victor D. Brenner that appeared on the first Lincoln Cent in 1909, and has been on the cent since. The reverse showcases a design by Joel Iskowitz that was sculpted by Don Everhart. Lincoln is standing in front of the capitol building in Springfield, Illinois. As the third coin in this series, this one is meant to highlight the importance of his professional life. It is here he taught himself to become a lawyer, and where he first participated in politics. The first coin in the series, the Lincoln Cent Birthplace included a log cabin where Lincoln was born. The Lincoln Cent Formative Years coin came next, and showed him reading a book after doing some rail splitting. Abraham Lincoln became the 16th President of the United States in 1861, and would serve his country during the Civil War. The joy he felt at the end of the war was short-lived however as he was assassinated within a week of its end. Previous releases in this series saw intense interest, for more information see Lincoln Coins Sold Out on CoinNews.net. Part of the bicentennial celebration, the Lincoln Silver Dollar Proof or Lincoln Silver Dollar Uncirculated coins may also be worth investigating. 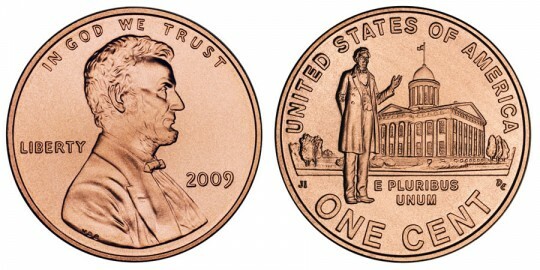 Information on the coin design chosen to follow the four 2009 Lincoln Cents may be found on the 2010 Lincoln Cent page. As it has been for the last 100 years, the obverse shows a portrait of Abraham Lincoln facing right. Designed by Victor D. Brenner, it includes the words "IN GOD WE TRUST", "LIBERTY", "2009", and the mintmark "D", if minted in Denver. Featured on the reverse is Abraham Lincoln standing in front of the capitol building in Springfield, Illinois. It was here Lincoln first tested the political waters, and where he became a self-taught lawyer. Also on the reverse are "UNITED STATES OF AMEICA", "E PLURIBUS UNUM" and "ONE CENT". It was designed by Joel Iskowitz and sculpted by Don Everhart.